A progressive and dynamic leader of the team of young engineers Dr. Parag Jain is the Director of RIT. An M.Tech and Ph.D in computer science, he has the distinction of working as a research scholar under the guidance of internationally acclaimed emeritus Prof. Dr. S.C. Gupta, ex Professor Indian Institute of Technology, Roorkee. He has thirty international and nine national research papers to his credit which were published in reputed International & National Journals. 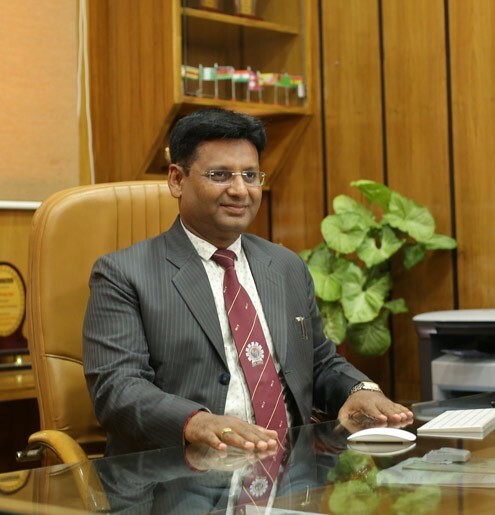 Apart from his administrative assignments Dr. Parag Jain is continuously contributing to academic and research pursuits wherein eight Ph.D. research scholars are researching under him in Uttarakhand Technical University. He has been guiding projects at institute level also and owing to his excellent guidance, the model submitted by RIT undergraduate students in “Texas Instruments Innovation Challenge India Design Contest 2015” has won laurels, and he has received the Certificate of Appreciation for mentoring the students for their outstanding model. He has attended many International Conferences, Seminars, Workshops and Faculty Development Programmes on cloud computing, effective use of teaching tools in the class room, and policy based IP creation and management etc in IIT Roorkee. He also attended “Cloud Computing Security Issues and Challenges : A Review”, and International Conference on Systemics, Cybernetics and Informatics (ICSI-2017) under the aegis of Pentagram Research Centre India, Avtar MedVision US., LLC., NC., USA held at State Gallery of Art Madhapur, Hyderabad. The wealth of a nation is evaluated in the number of educated men and women it harbours. In the competitive world where knowledge determines the winners and losers, it has become increasingly necessary to ensure that, besides a sound education, students have the ability to excel and win in the global context. Believing that Knowledge is Power, Knowledge is Safety and Knowledge is Happiness we venture at RIT to equip our students with latest subject knowledge and strive to create a learning culture that promotes quality, innovative exploring, discipline and in the process grooming students to face the challenges of the corporate world. State-of-the-art facilities in job-oriented disciplines, brilliant faculty, seminars, workshops and a regular industry-academy interaction make RIT a top ranking institution in this area. We are optimistic and this trend will continue as long as people value quality education and discipline. RIT aims to provide the right direction to the young generation who can focus on their future right from the beginning of their career. RIT extends all support for academic and personal growth of the students in order to convert them into responsible engineers to meet the challenges of industries. We focus on imparting instructions that help in creating an environment conducive to learning by self-study and discussions. Attendance in the classes is most important for us. Whether a student or a teacher, classes are the top priority and no one can afford to miss it. That is the fundamental recipe for success. This seems to be a little harsh but it in fact lays the basic foundation of our Academic Programme. At this Institute we are providing best possible opportunities and infrastructure for nurturing the students in a serene environment. Our Academic Programmes are growth oriented and relevant for developing critical thinking and problem solving skills. We intend to make Teaching-Learning mechanism to be at par with the international standards and firmly believe that by imparting quality education our students will be ready to compete globally. Dear Students, you are now embarking on a great learning adventure and you may face challenges of varying degrees and nature ahead. But I am sure these challenges will inspire you further and undoubtedly, you will be the achievers at the end. Once you pass through the portals of RIT, the road ahead will be opened for a journey of wonderful life. I also know for certain that you will lead the change of tomorrow and the world will admire your success.